Well, I am afraid I am going to have to say this mod isn't going to be updated. I just recently upgraded to windows 10, and something terrible happened. I don't know exactly how to fix it, but for some reason none of my tools are working. LiteBlock is a mod that aims to bring back Vanilla Skyblock. It adds simple crafting recipes that allow you to expand your island with blocks other than just cobblestone and wood. It is the mod that I am learning off of, but as something actually took shape, I decided to put it up for others to see. There are two ways to make dirt, with cobble or composting. Composting is just simply putting 4 apples or saplings in crafting. With cobble, put cobble in your crafting until it turns into Coarse Dirt. Place the Coarse Dirt down on the floor and hoe it into regular dirt. Pick up the dirt and, in your crafting, put it with a water bucket. Done. Most hostile mobs will drop a Fragment Piece on death. Craft four of these into a World Fragment. 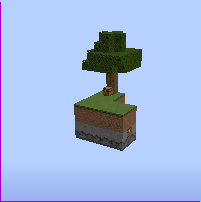 If you have a Fragment Piece, just place it with a sapling to cycle through the saplings. Smelt rotten flesh to get leather. You can turn 1 wool into 4 string. Craft clay with one sand and a water bucket. Put leaves in a ladder shape. This sword can one shot Zombies, Creepers, Spiders and the such. Since there's no way to get iron other than zombie drops, you will probably need a farm. Is there any way we could possibly add a world type that would spawn exactly one SkyBlock island for people to use for Forge? As far as I'm aware, no other mod does it for forge, especially 1.8. I could potentially whip up a few islands for it to spawn. I don't know how I can package a map with a world type like the ME2 Modpack does, but I could look it up. You can also create your own islands by going into a superflat world with the preset code 3;0;1, then typing /setblock (your coords or tilde) minecraft:stone . That would give you a base block to build your island on.